The online events calendar for the District of Roth provides an overview of all events that take place in the districts 16 municipalities. The Gilardihaus, built between 1723 to 1728 provides, together with the adjacent Heckelhaus is an impressive architectural ensemble, determining the character of the Allersberg market place. For over 1000 years the castle hill at Hilpoltstein has had some form of fortification. Until 1385, the castle was the seat of the Herren von Stein, later an important post for the Dukes of Bavaria. 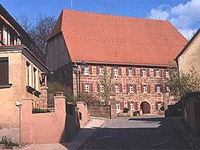 Built in 1473 by Duke Ludwig the Rich in the area of the outer bailey, through the years the building was used as a granary. The four-winged renaissance castle with a three-story main building and three towers was built in 1535 – 1538. Today in Roth it is open to the public with guided tours available. The former Schaeff-iron hammer lies 30 km south of Nuremberg, near the village of Eckersmühlen. 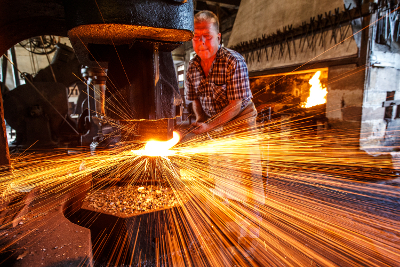 Located on the river Roth this gem of industrial history is now a museum - a living museum, where visitors can experience the art of the hammer smith and the handling of glowing iron, a spectacular impression directly before your eyes. For more than five generations the iron hammer belonged to the family Schaffer, a ramified dynasty of iron smiths. Displays the development of building trades, outstanding objects such as a late gothic terracotta relief of the “Mount of Olives” scene (picture) give an insight into the city's history. Another highlight is the museum building, for example, with the remains of an excavated Weiss bier brewery. Located in the former margrave hunting lodge museum tours take in the residential and state rooms from the turn of the century. Working machines (e.g. weaving looms, crochet machines, circular knitting machines, and fringe machines) take you back to the working world of our ancestors around 1920.